The impossible happened on September 20. In the middle of the night, the spot price of electricity in Texas fell below zero and hit -$8.52 per megawatt hour at its lowest point. The price hovered around zero or less until around 8:15 AM when people started waking up and using power to make their morning coffee and check the news. Why would providers in a state in love with the free market sell a product for no cost? Well, it’s partially due to Texas’ large installed wind capacity – 12,625 megawatts, to be exact. Surprising, I know, but this oil-rich state got 9% of its electricity from wind power in 2014. Of course, you can’t control when the wind blows. That’s one of the power source’s downfalls and why storage is so necessary. Last week, the wind was strong in the middle of the night, when power demand was at its lowest. All other energy producers curbed their production and unchecked wind power dominated the energy mix. You see, most states are part of large regional networks, meaning energy is shared across state lines. But Texas’ grid is self-contained. This means it isn’t affected by blackouts in neighboring states, but also that it has to use all the electricity it produces. The grid is run by the Electric Reliability Council of Texas (ERCOT), which has set up a complicated continuous auction system. This combination of factors – large amounts of wind power, an electricity island, and continuous bidding – led to the negative price. 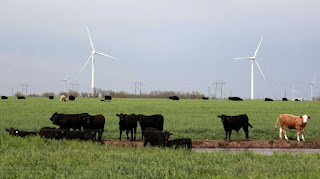 Demand was low, the wind was blowing, and providers could only sell to ERCOT. On top of that, wind power producers automatically get federal subsidies for every kilowatt produced. So, they had every incentive to sell for as low as possible. Seems like Texas needs to get some electricity storage. And maybe Texans need to start waking up in the middle of the night to do their laundry, run their dishwashers, and watch TV.